Wall Street Journal: Wonderful review of “Hemingway Didn’t Say That” appeared in “The Wall Street Journal” on April 10. The reviewer was top quotation expert Fred R. Shapiro editor of “The Yale Book of Quotations”. New York Times: Great article about “Hemingway Didn’t Say That” and the Quote Investigator website appeared in “The New York Times” on April 27 titled “That Wasn’t Mark Twain: How a Misquotation Is Born” by Niraj Chokshi. A fun quiz based on the book was published the next day. National Public Radio: All Things Considered: Excellent interview piece titled “Hemingway Didn’t Say That’ (And Neither Did Twain Or Kafka)” broadcast April 4, 2017. Great thanks to interviewer Robert Siegel and producer Connor Donevan. 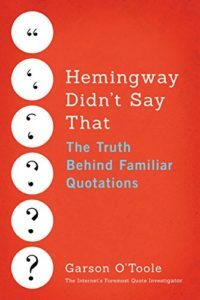 The first book from the Quote Investigator is called Hemingway Didn’t Say That: The Truth Behind Familiar Quotations. The publication date is April 2017, and you can visit the pre-order webpage by clicking on the book title in the previous sentence which is a link. The content is based on this very popular website. The introduction, theme, and organization are new and innovative. Publishing has entered a tumultuous period, and every author faces a set of decisions which are exciting and challenging. QI selected Amazon Publishing which has grown into a powerhouse since its launch in 2009. Amazon is the top channel for self-publishing, but this book is not being self-published. The team includes: editor, copy editor, book cover designer, and publicity person. Hardcover, paperback, and Kindle versions of the book will be released via the Little A imprint of Amazon Publishing.